Let’s face it—running a networking event is hard work. This morning, the rest of the team and I are attending Social Media Breakfast Tech Valley #11 (SMBTV), a bimonthly morning networking event featuring local and national speakers who present on a variety of social media-related topics. We’ve collaborated with several companies in the area, including Enable Labs, LinguaLinx, and Media Logic, to organize and run the event. In the midst of finishing client projects and dealing with end-of-month responsibilities, running a networking meet-up can seem like madness. To be frank, we didn’t decide to take on more responsibilities strictly out of the goodness of our hearts, although SMBTV is a great way to give back to our community. We see return on our efforts in the forms of branding, authority building, and most importantly, visibility to potential job candidates. The agency-to-talent ratio in Upstate New York is pretty daunting from a hiring standpoint, so we are eager to find opportunities to highlight our company and identify potential team members. In short, we’ve justified the ROI for our involvement. Creating, organizing, or hosting a networking event can satisfy numerous business development needs in addition to building your team and giving back to the community. Before you jump in, start with a plan that helps you measure the ROI on networking events. Although you must have a clear goal in mind for the event, remember everyone else has their own goals, too, and ultimately, it’s a group effort for group benefit. Sometimes the best way to accomplish your own goals is to help others reach theirs. 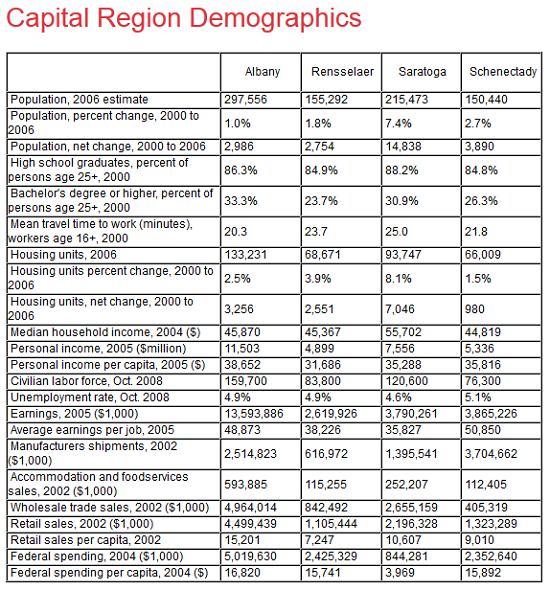 Your community might be a geographic region, an industry, or an interest group. Whether you’re forming a small local meet-up or a large national conference, defining and outlining an outreach strategy is an essential step to measuring ROI and supporting your outlined goals and objectives. For SMBTV, we take into account the types of businesses in our area, their sizes, and current social presences. Running SMBTV might not make sense if there were very few small- to medium-sized businesses with at least one active social account in our area. Doing this analysis also helped us identify speakers for future events. Here are a few resources to help you define and study your community. 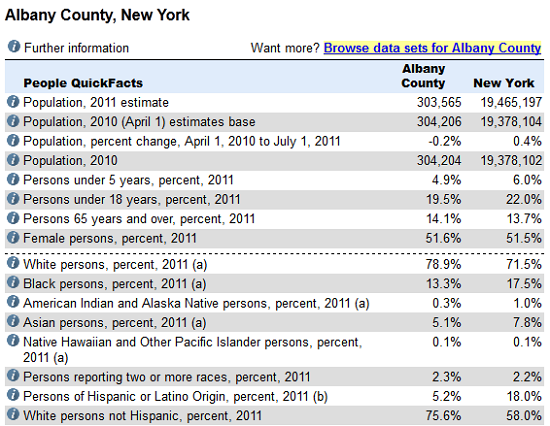 Digging into census data will help you identify specific demographics you may want to reach through your event. The data provided by business owners themselves is highly valuable. Your local Chamber of Commerce should be able to provide a list of all the businesses in your area (that are members of the Chamber, at least), which will allow you to target specific industries, groups, or businesses, both for attendance and speakers. Just because your event is local doesn’t mean you can’t include some industry heavy-hitters from other areas. SEER Interactive did this when they hosted an SEOmoz meet-up at their Search Church. A handful of mozzers attended all the way from Seattle, and several local Philly businesses were in attendance as well. 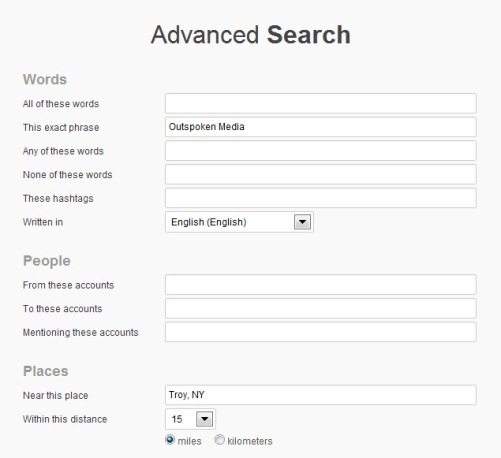 This search function not only allows you to enter a location, but a search radius, so you can find users nearby who have mentioned your search term (a business name, your event topic, etc. ), and invite them to attend or speak at your event. 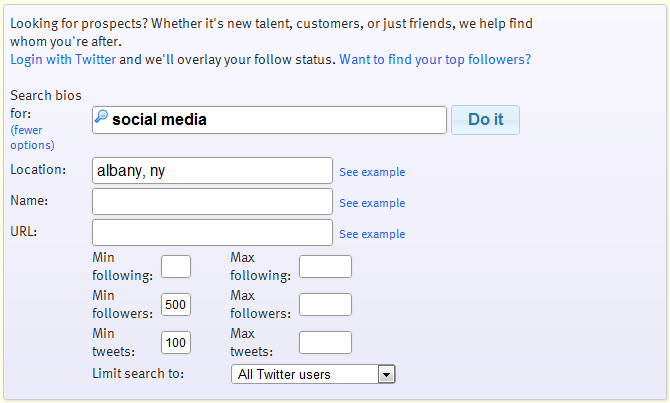 This site makes it simple to search Twitter for all users with a specific keyword or words in their bio, location, name or URL. 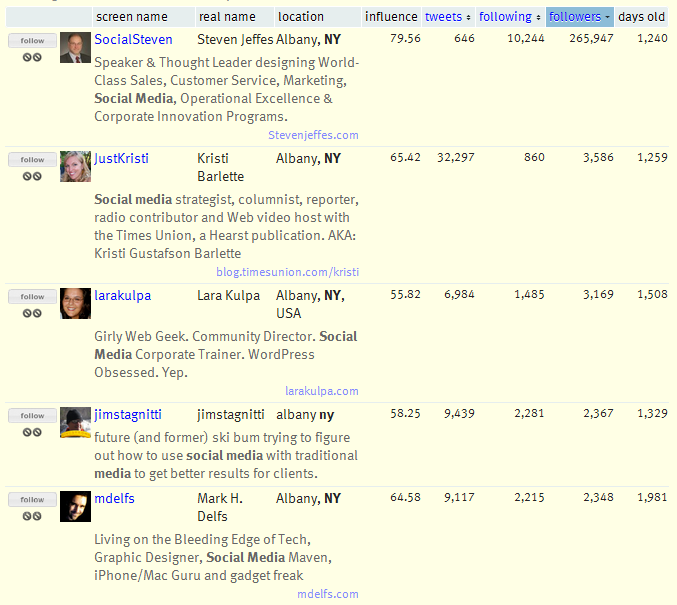 You can sort the results by screen name, real name, location, influence, followers, following, and age of the account. 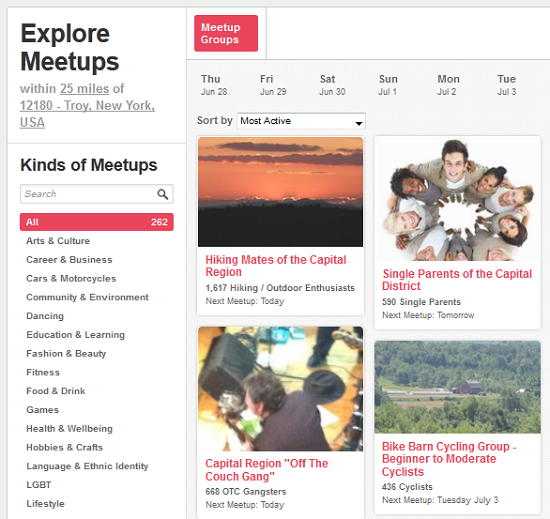 You can quickly identify active users with similar interests in your area. Remember that communities are dynamic. Defining it may be an ongoing process to ensure you’re including new members, and addressing the changing needs of that community. Changes in the community may translate to changes in your events, and possibly even your goals. “Feeling good” about the event is not a metric. Sure, you could start counting high fives and pats on the back. But unless you are able to quantify the attributes that actually equate to success, you’ll never really know whether the event was worth your time and resources. Depending on the structure of the event, you have a few options for measuring success. Tools like Eventbrite track several metrics, including registration page views, tickets sold, e-mail invitations sent, resulting registrations from e-mail blasts, and conversion rate. If you’re using a tool like Eventbrite for registration, you can use dashboard tools after the event to get a quick snapshot of these metrics. You can also use data from previous events to inform future promotion decisions. For example, data gathered from SMBTV #9 shows that with a 10.7% conversion rate, the e-mail blast was not the primary initial driver for event registration. It’s possible it was the first step in getting attendees to register later, but the e-mail invitations did not drive conversions in and of themselves. With this data, we can either find ways to improve our e-mail messaging, or focus on other promotion efforts for future SMBTV events, and see what drives the most conversions. In addition, although not all tickets were sold for SMBTV #9, the venue was larger than those for other events, and overall, this event had the highest attendance of any SMBTV meet-up. This information can help us make informed decisions about community engagement, venue space, event sponsorships, talent attraction, and much more. Those are good metrics for the event itself, but what about that all-important ROI? 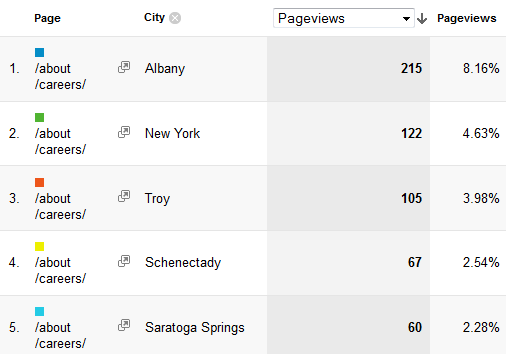 For our purposes of gaining exposure in the Capital Region and identifying potential hires, we may look at the cost per acquisition for career page views received around the time of the networking event and the number of new submissions to the careers email address. Did the metrics we defined help us quantify the success of the event? Did we reach enough of our target community to support and accomplish our goals? Did we target the right community to support and accomplish our goals? Would we repeat the event? If the answers to the first four questions are “yes,” you’re on the right track. And the answer to the last question will vary, but something can always be improved, especially an event that involves so many people with different tastes, expectations, and reasons for attending. No one event will ever address every need for every person. In other words, just like you won’t be counting high-fives as a measure of success, your metrics should never include “make everyone happy” because it’s not going to happen. Keep your goals attainable, and your metrics logical and data-driven, and you’ll be in a much better position to measure not only the success of your networking event, but the return on your investment of time, energy, and passion.